Building your own custom PVC patio furniture allows for endless options. Durable and affordable, PVC pipe is easy to assemble and plans are usually easy to modify. Need a chair a little wider or a table a little longer? Simply increase the lengths of pipe used. Since PVC pipe fits snugly inside the connectors, gluing the assemblies is completely optional. Without glue, each PVC project can be disassembled, remade, resized, stored or transported with unparalleled ease. Seasonal items like patio furniture are ideal candidates for do it yourself PVC construction. PVC patio furniture is durable, lightweight, affordable and easy to assemble. Connect two 9-inch segments of pipe with a T connector. Repeat to create 4 identical segments. Organize the four completed segments and four 18-inch segments of pipe into an octagon with the open T connector openings pointed downward. Connect the ends with 135-degree elbow connectors. Trace the outline of the tabletop onto a piece of PVC sheeting. Cut out the shape. Place the sheeting aside. Insert a 30-inch pipe section in each downward T connector opening. Attach a 90-degree elbow to the bottom of each 30-inch pipe. Measure the exact distance between one 90-degree elbow opening and the opening on the opposite connector. Divide this figure by two. Cut four pieces of pipe to this length. Insert one pipe from step 5 into each 90-degree elbow opening. Connect the four pipes with a four-way cross connector. Connect two 18-inch segments of pipe and two 24-inch segments of pipe with three-way corner connectors so that the middle opening faces upward. Orient the rectangle so that a two-foot segment is nearest to you. This is the chair base. Insert an 18-inch segment of pipe into each upward facing opening. Place a three-way corner connector on the front two pipes, parallel to the lower base. Place a four-way corner connector on the back two pipes, parallel to the lower base with one opening facing upward. Use two 18-inch segments and two 24-inch segments of pipe to connect the connectors. Do not glue the 18-inch segments in place, even when the assembly is complete. This is the seat. Place an 18-inch segment of pipe into the remaining upward openings. Do not glue these in place, even when the assembly is complete. Place a T connector on top of the pipes, so that the middle opening faces the opposite pipe. 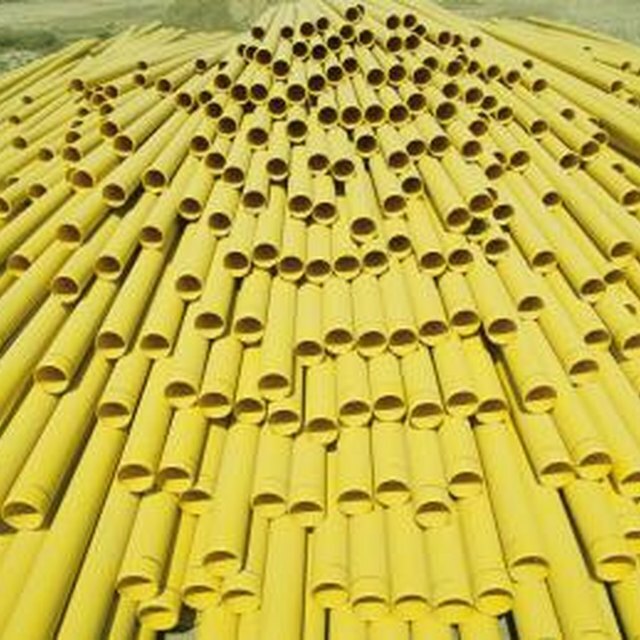 Connect the two pipes together with a 24-inch segment of pipe. This is the back of the chair. Create the seat from a piece of durable fabric that measures 18 inches by 30 inches. Place the fabric in front of you so that the long side is nearest to you. Overlap the last three inches or so on each end. Sew the overlapped portion to the fabric to create a loop. Slide the 18 inch segments from the side of the seat through the loops, and reattach them to the chair. Repeat step 5 to create a back for the chair, and attach. For a sturdier seat, connect two 12 inch pieces of pipe with a T connector. Place a 9 inch segment in the open T connector opening. Repeat to create a second piece. Connect two 9-inch pipe segments with a T connector. Place a 12-inch piece of pipe in the open connector opening. Repeat to create a second piece. Use these segments in place of the 24-inch and 12-inch pipe segments. Connect the four middle pipes with a four-way cross connector. Place a cushion over the seat instead of creating the fabric seat in the last step. After each project has been dry-fitted, it can be disassembled piece by piece and glued together with PVC cement for greater strength. No piece should ever be glued until the entire assembly has been fit together. Some segments, such as the chair seat, should never be glued at all. To apply PVC cement, swab a small amount of cement inside the fitting and push the pipe inside the fitting quickly. This prevents excess cement from oozing outward over the pipe. Be careful: PVC cement hardens quickly and is impossible to break from the pipe so mistakes cannot be corrected.